Started in January 2017, the Galveston Bay Injured Bird Response Team has coordinated volunteers from Master Naturalists, Audubon Texas Estuarine Rescue Network, Galveston Animal Control, Galveston Island Humane Society, and Wildlife Center of Texas to rescue over 350 injured birds of 66 different species! Galveston County is a bird paradise! Numerous resident and nesting species call our part of the Texas coast home, and we are in the middle of a major north/south bird migration flyway. With such a concentration of birds, finding injured, sick, and orphaned birds is commonplace. The need for the ability to rescue and treat Galveston Bay Area birds first came to the attention of Galveston Bay Area Texas Master Naturalists (GBA-TMN) in the fall of 2014 when many Brown Pelican juveniles became sick or entangled in hooks and fishing line. Many were rescued through an impromptu call for volunteers and rehabilitated at the Wildlife Center of Texas (WCT) in Houston. Throughout 2015 and 2016 several chapter members continued to rescue and transport injured birds independently, with no organizational support or coordination. The lone local permitted rehabilitator was overwhelmed with calls and injured birds to the point that she had to stop taking most birds by the summer of 2016. Injured birds along area shorelines of Bolivar, not covered by Galveston County Animal Control, continued to be found with no one and no system in place to rescue or transport them to a rehabilitator. Bolivar Peninsula is particularly troublesome due to the ferry crossing and distance to WCT. In January 2016, an “Injured Bird Response Plan” was presented by the Plastic Pollution Prevention (P3) Partnership at the “Back the Bay” Symposium. In the fall of 2016, GBAC-TMN members, Sandy Parker and Stennie Meadours, asked Sharon Schmalz, Executive Director of WCT, to conduct an injured bird rescue training for Bolivar residents and interested parties. Seventy people registered for the first training on Jan. 8, 2017, including Galveston Animal Control (GAC) officers who were interested in getting some assistance with birds they rescued on a daily basis. 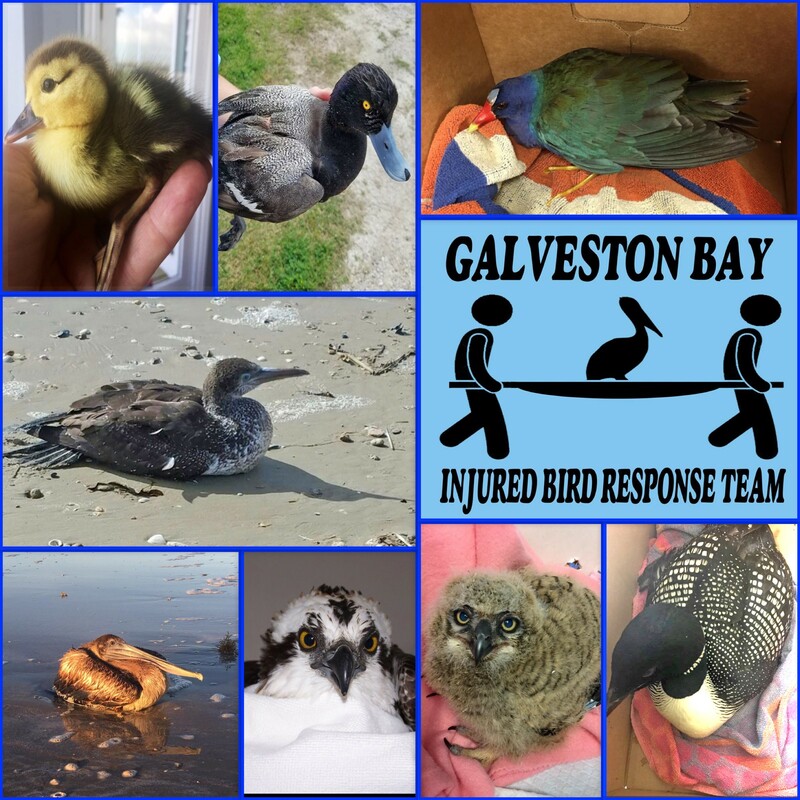 The “Galveston Bay Injured Bird Response Team” was born! Three teams were established, Bolivar, Galveston, and Mainland/Clear Lake, with the initial primary goal of “relaying” birds from Bolivar through Galveston to Clear Lake, and to WCT. A Facebook group page (“Report Injured Birds found in Galveston County”) was started to help facilitate reporting and now has almost 750 members. Over the last year each team has changed in scope and responsibility. The Bolivar team (only 3 active members), led by Bolivar resident Patti Roznovak, has become the primary “bird rescue” team on the entire peninsula. The team finds, rescues and transports birds to the ferry where they are met by a Galveston team member, a GAC officer, or taken directly to the Galveston Island Humane Society (GIHS) for holding. To date, more than 60 injured or sick birds have been transported from Bolivar to Galveston. The Galveston Team, led by Tim Long (GBA-TMN member), have become the primary transporters to WCT. The majority (~70%) of birds transported to date have been rescued on Galveston Island. Some rescues/pickups are done by team members themselves, but most of the birds transported are rescued by the Galveston Animal Control officers or dropped off at GIHS by the public. Most of the transport from Galveston has been all the way to WCT (100+ mile round trip), although some birds have been relayed by the Mainland team. The Mainland/Clear Lake Team, led by Sandy Parker, has become the primary transport for birds rescued in upper Galveston County. Initially, the plan was to relay birds through Clear Lake from Galveston, but recently they have starting transporting some birds from the Galveston County Animal Control shelter in Texas City. There is certainly opportunity to expand the scope and influence to the Mainland team across the entire Dickinson/Texas City/Kemah/League City area. In just the first year, over 350 injured birds of more than 66 different species have been transported, along with a number of Opossums, baby Raccoons, and rabbits! Included in those species are lots of gulls, pelicans, and herons, but also rare offshore birds (e.g. Masked Booby, Magnificent Frigatebird, Gannet, & Bridled Tern), and one “Texas First” White Crowned Pigeon. As the group’s efforts mature, expand, and gain recognition we expect these numbers to continue to increase, fluctuating around the migration and nesting seasons. In the early morning of May 4th, 2017, a tragic migratory bird “building collision” event occurred in Galveston. After initial notification to one of our team members by a building occupant, rapid response was given by GAC officers and also members of the GBIBR Team. Almost 400 birds died in both Galveston and Clear Lake. The 6 surviving birds were transported to the Wildlife Center. Within a couple of days the building management volunteered to turn off the exterior lighting for the remainder of the migration period. While building strikes by migrating birds are quite common, the magnitude of this event captured both local and national media attention, and has resulted in agreed local changes to external building lighting practices during future migration periods. None of this could be accomplished without the support of volunteers working with local organizations. More volunteers are needed! If you are interested in becoming a volunteer to transport injured birds to the Wildlife Center of Texas, email Stennie Meadours stenmead@aol.com or Tim Long tikibloke@yahoo.com. If not within city limits contact: Wildlife Center of Texas 713-861-9453, and they will contact the GBIBRT. You can also report injured birds on the Facebook page “Report Injured birds found in Galveston County,” which is monitored by GBIBRT members. Cover Story birds, wildlife. permalink.